Click on the image and print your own poster for friends and neighbors. Set up your printer for legal paper (8.5 x 14 inches). Choose a nice color paper! See you soon. Not only has George finished the 32nd original melodrama at least 9 weeks early, OK three week, BUT. . . wait for it. . . first reading is tonight, 15th of March. Due to the Easter (Eostre, Oestrus?) festivities, our first weekend will be delayed from the traditional first weekend in April to the 18th and 19th of April, then follows through the next three weekends to May 9th and 10th. So for you math whizzes, that's a full month of rehearsals. . .unheard of! Our crack team of thespians need only moments for rehearsal. And after years of our dinner and melo without a price increase, we have a $5 jump - Adults, $30, Seniors on Sunday nights, $25 and children at $20. Remember all proceeds of this volunteer effort provide matching funding for grant applications to renovate and maintain Silver Plume's historic public buildings - your generosity is immediately multiplied. Doors open at 6pm Saturdays and 5pm Sundays - dinner service last about two hours as does the melo - we'll let you do the math. Book now by email "garyregester@gmail.com" (named for me) or telephone +1303 569 3236 with messaging. For more personal attention +1303 569 2023. 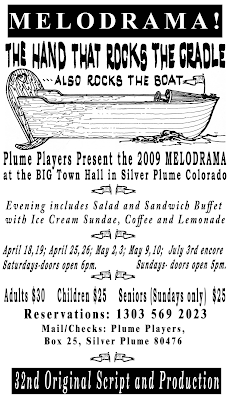 Or, trust us with your money, send checks to hold reservations to Plume Players, PO Box 25, Silver Plume CO 80476 USA (yes, that far).